Indigo Manila is known for its baby products. I actually wanted to get a pouch from them but I figured I have to be practical as my sling can render the same service the pouch will. I also have yet to try their other products. 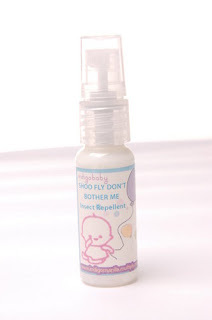 At the breastfeeding training I attended, I had the good luck to get a sample of their Shoo Fly Don't Bother Me Insect Repellant. It really smells great and so far, I would say it's effective. My sister-in-law, however, uses it as plain lotion because she really loves the smell. Most insect repellants smell strongly of citronella, and though Shoo Fly has a hint of the same, it just really smells better. This is also absolutely considerate of baby's sensitive skin, since the Moms who invented the formula are concerned moms themselves. So order now. Indigo Manila will actually have a booth at the upcoming Expo Mom.